This mountain is best climbed by first using a boat for transport to Sandbakken at the base of the climb. 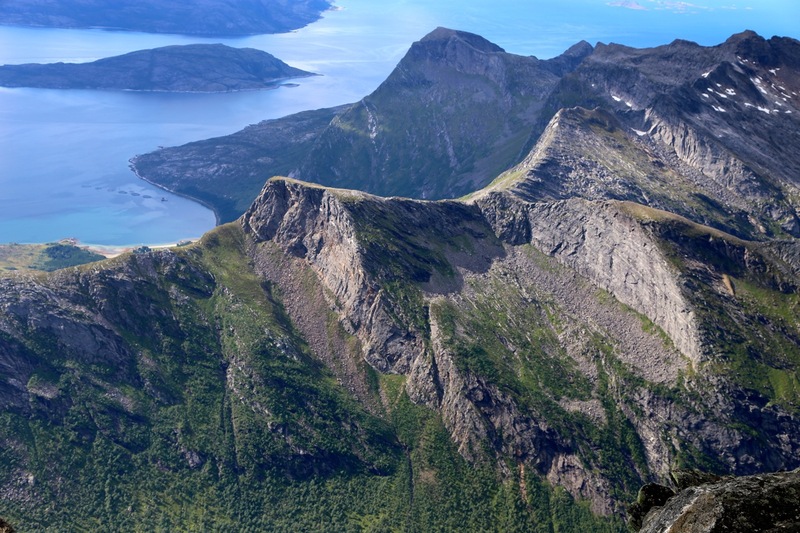 Thus, one should arrange for (private) transport, normally from Nordfold in Steigen. I arranged this with Ketil Hansen (mobil: 96229285). 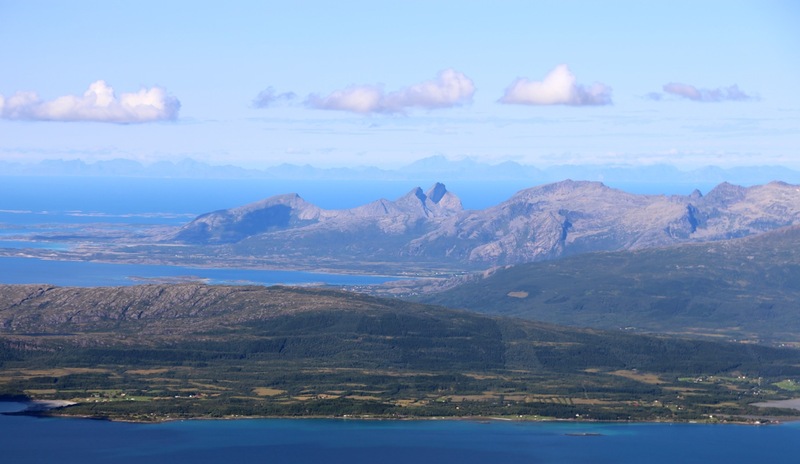 Drive south on Steigen and follow signs for Nordfold. Note: Due to the continuous shrinking of the glacier, one may now complete this ascent without ever walking on the glacier. See further details below. 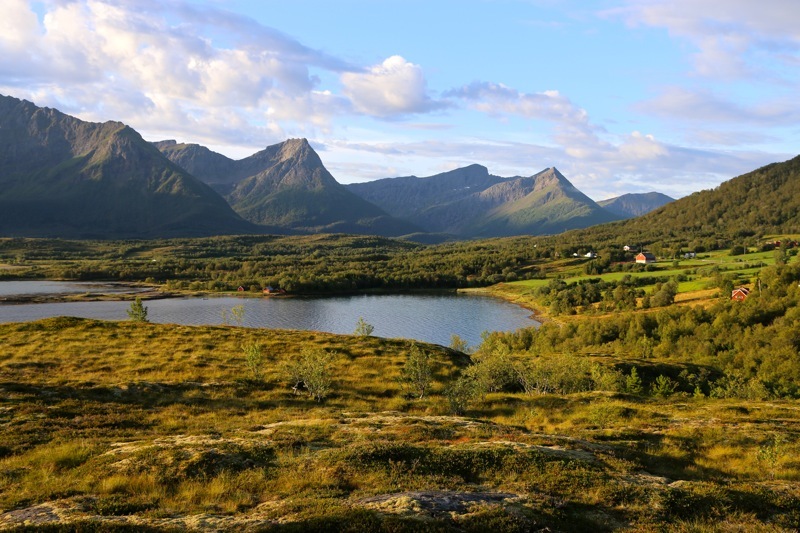 From Sandbakken, head directly up between the houses and follow a small road (wide path) that gradually bends left. You will easily locate a sign that points right and says Helldalisen. Head uphill in this direction. The trail may be difficult to spot/follow here. 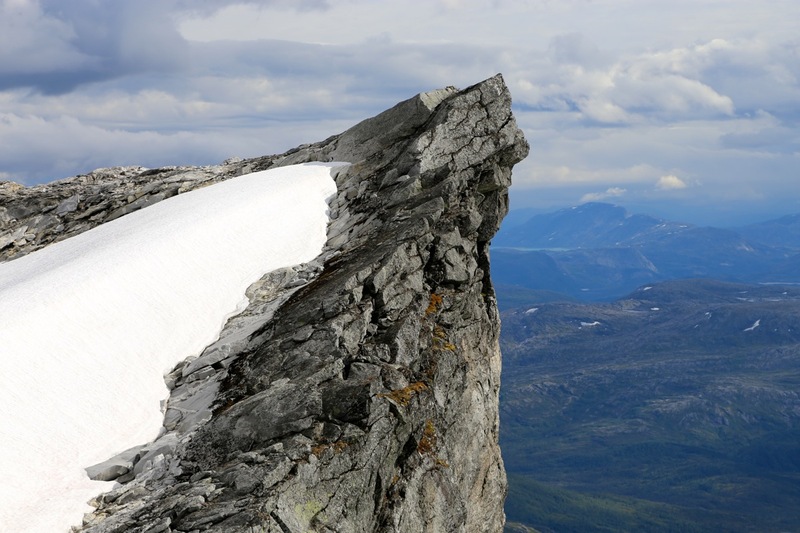 Higher up, you will notice a fairly wide cliff that one certainly must circumvent. 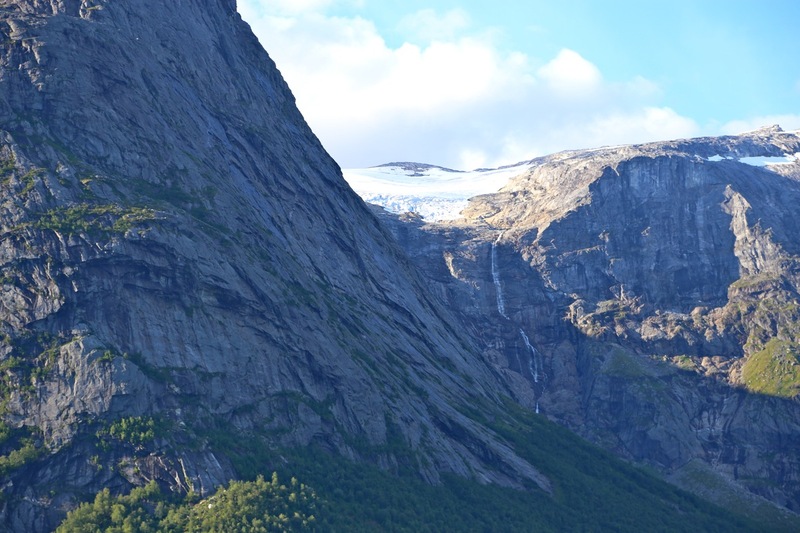 The natural passage is a small ramp that runs up on the left hand side of the steep rock. A very clear trail originates here. Continue to follow this trail uphill. The trail runs near a couple of good places for drinking water, then climbs a small local ridge before a short descent (passing another pool of water), that will get you onto a final, small ridge that extends uphill. 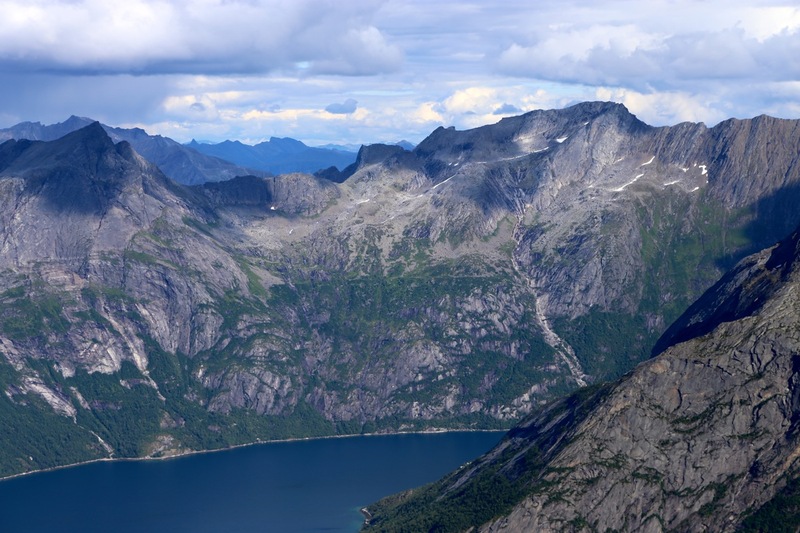 Gradually, one now gets into more open terrain, from here and further uphill the terrain is characterized by sloping (slick) rock with grassy ledges (many quite wide) in between. These formations generally runs uphill towards the climbers left side. The route is now marked by cairns and some red paint. It mostly takes advantage of the terrain and gains elevation by moving left. However, in a few places the route bends right in order to gain a ledge at a higher level. One should pay close attention to the cairns. A couple of waypoints along this stretch: N67.68086, E015.42643 a bit before you reach 800 meter of elevation and N67.67903, E015.42204, just before 900 meter. A bit above 900 m, the route naturally bends more right in order to gain the area near point 1113 (as marked on the map). From point 1113 one may now pick a route via point 1312 all the way to the summit by staying on the rock that runs along the left hand side of the glacier. 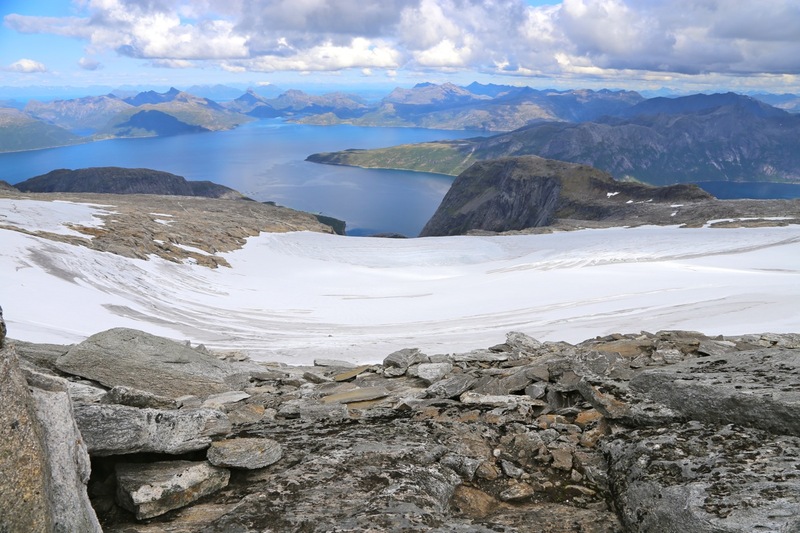 It may, however, be more comfortable and convenient to walk on a small snow ridge that runs along pretty close to the left side of the glacier. 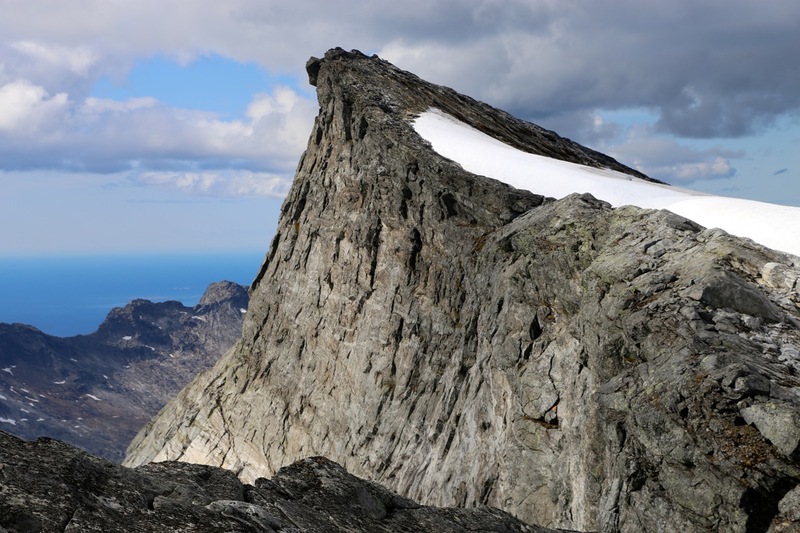 The summit itself is free of ice and forms a very nice apex on this mountain. 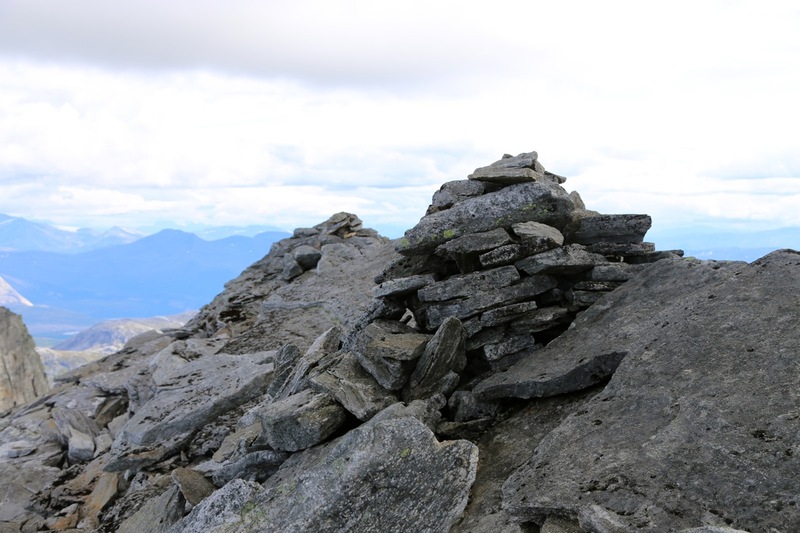 There are two small cairns on a short top ridge. 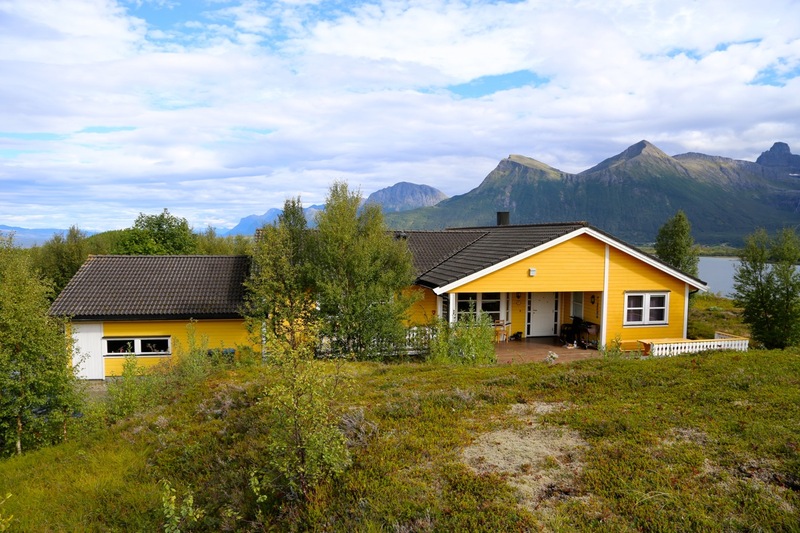 I got up this Monday morning and looked out at the nice view from the house of Nina and Agnar. 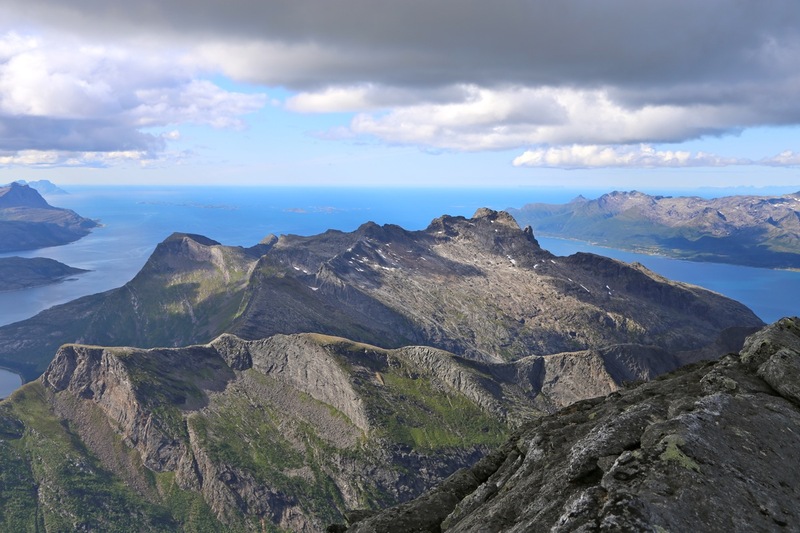 This promised to be the best day so far, and very timely, since my goal was the highest peak in Steigen. I met Ketil at the Nordfold pier (quay) where he was ready with his small boat, around 0800. There, at the pier in Nordfold, I also got my first view of Helldalisen. The sea was pretty nice, but not calm enough for running the boat at high speed, thus we moved across to Sandbakken with no particular hurry. While we were crossing, I got my first view of the glacier, it certainly looked like this is yet another example of a shrinking glacier. There were flags from at least two houses, people that stay here during the summer. 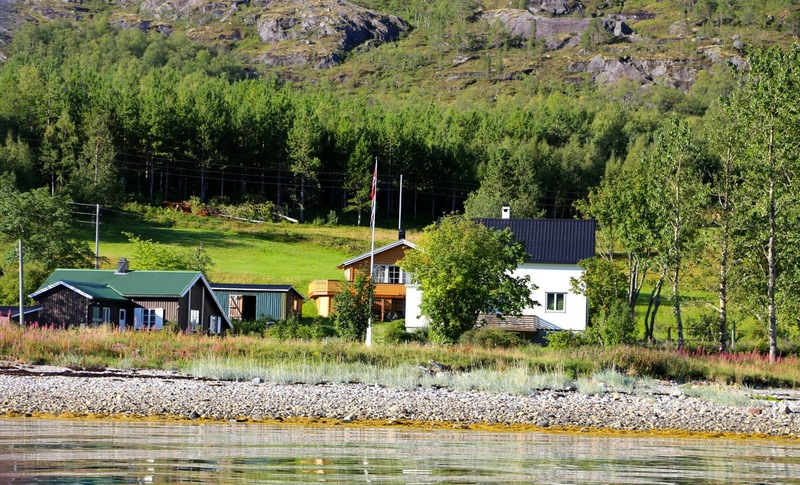 Sandbakken does not have any all-year inhabitants any longer. 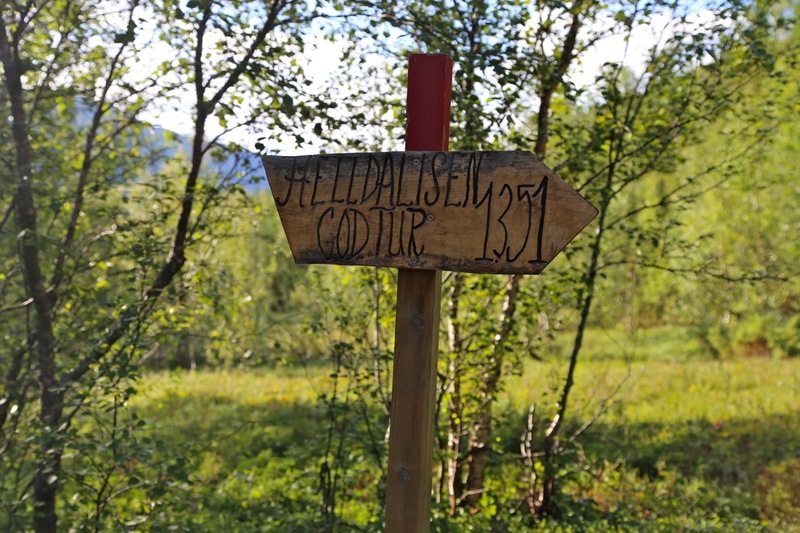 I started walking at 0900 and quickly discovered the new sign indicating the route to Helldalisen. However, I immediately lost the trail (the trail does not exist) and continued uphill without being concerned. Soon, I discovered the rockface that everybody understand must be bypassed using a small ramp on the left side. Obviously, a clear trail starts here and continues up to the rocks where cairns take the role of showing the route further along. Some places the cairns are hard to see, however, the route runs uphill and to the left and it was easy to recover from small mistakes regarding the route. 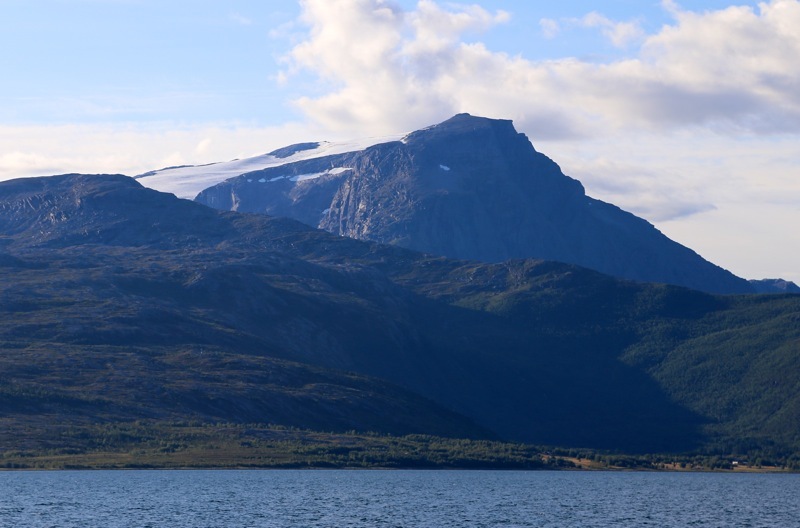 Along the way, I did take the opportunity to look across the fjord towards the 1215 meter peak that I plan to climb on a second trip. 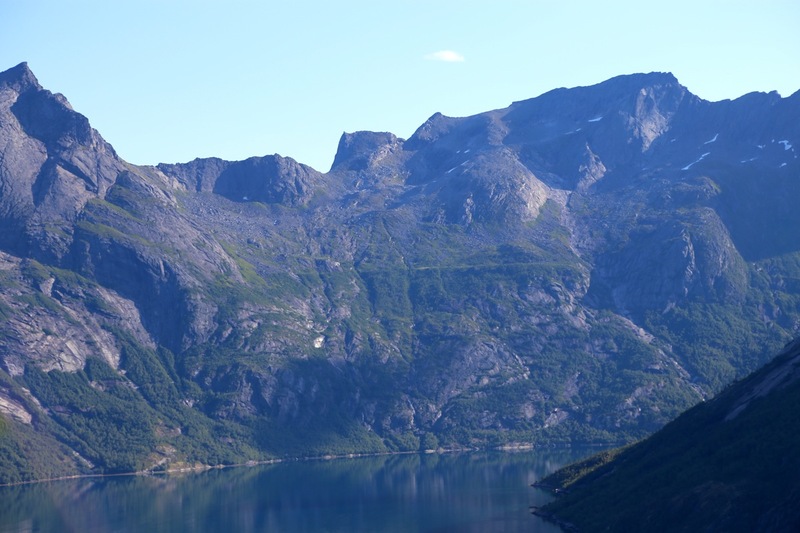 It certainly looked possible to access this peak directly from the fjord. 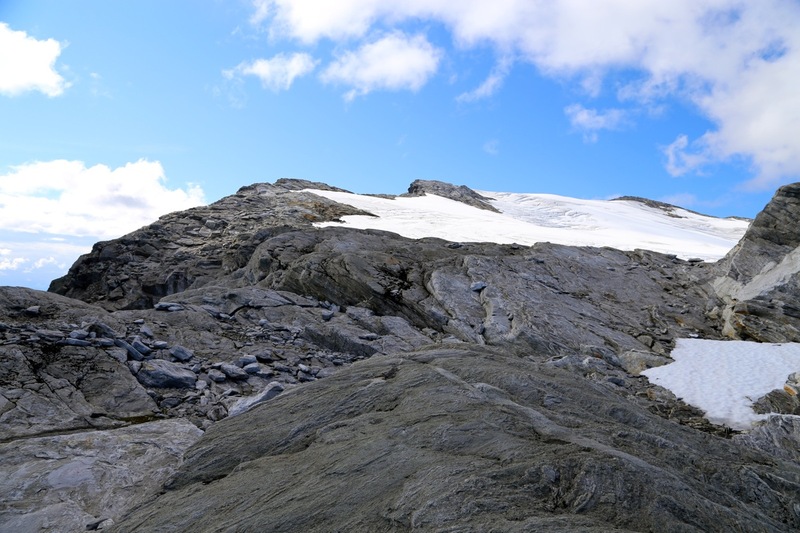 I arrived at the edge of the glacier and immediately observed that one may walk all the way to the summit along the leftmost edge of the glacier, that is, on rock all the way. 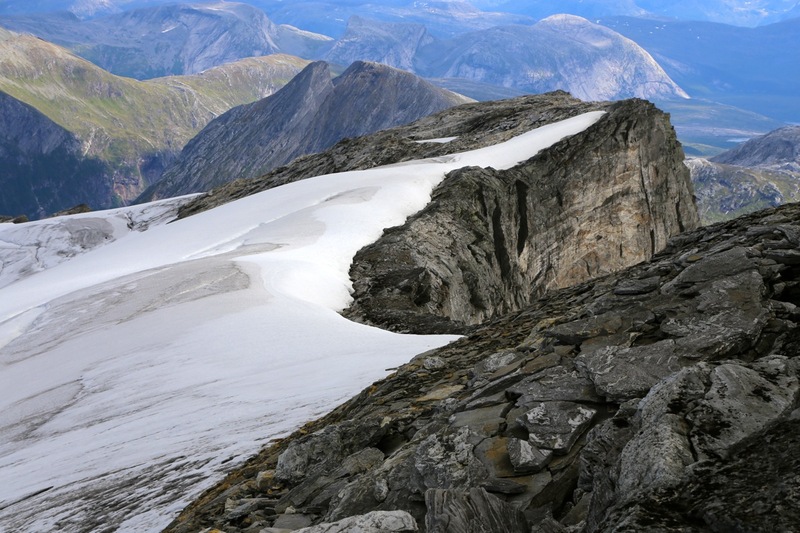 However, there was a very nice snow-field, followed by a snow-ridge that provided a better and more direct way to the summit. The view was already superb. I arrived at the summit at 1230, the climb had taken me a bit longer than expected. The summit was very nice with a good place to sit and enjoy the panorama views. I rested and took pictures until 1300, then started my return hike along the same route. Gradually, the weather became more overcast. Otherwise, not much to report. I called Ketil at 1400 and told him to meet me at Sandbakken at 1600. When I arrived at Sandbakken at 1550, he was already there. 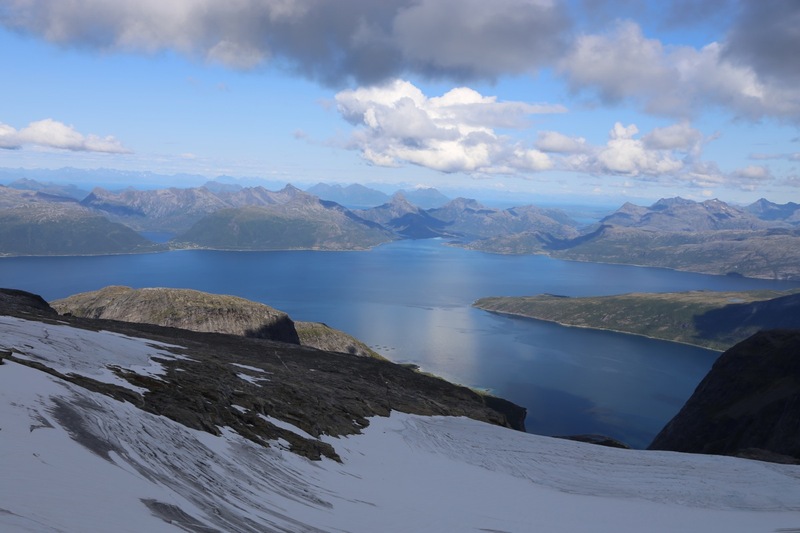 Kråktinden as seen from the summit. Summit 1215, next in line for a visit.